Over the last thirty years, the prison population in the United States has increased more than seven-fold to over two million people, including vastly disproportionate numbers of minorities and people with little education. For some racial and educational groups, incarceration has become a depressingly regular experience, and prison culture and influence pervade their communities. Almost 60 percent of black male high school drop-outs in their early thirties have spent time in prison. 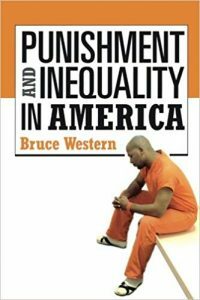 In Punishment and Inequality in America, sociologist Bruce Western explores the recent era of mass incarceration and the serious social and economic consequences it has wrought. Punishment and Inequality in America dispels many of the myths about the relationships among crime, imprisonment, and inequality. While many people support the increase in incarceration because of recent reductions in crime, Western shows that the decrease in crime rates in the 1990s was mostly fueled by growth in city police forces and the pacification of the drug trade. Getting “tough on crime” with longer sentences only explains about 10 percent of the fall in crime, but has come at a significant cost. Punishment and Inequality in America reveals a strong relationship between incarceration and severely dampened economic prospects for former inmates. Western finds that because of their involvement in the penal system, young black men hardly benefited from the economic boom of the 1990s. Those who spent time in prison had much lower wages and employment rates than did similar men without criminal records. The losses from mass incarceration spread to the social sphere as well, leaving one out of ten young black children with a father behind bars by the end of the 1990s, thereby helping perpetuate the damaging cycle of broken families, poverty, and crime. The recent explosion of imprisonment is exacting heavy costs on American society and exacerbating inequality. Whereas college or the military were once the formative institutions in young men’s lives, prison has increasingly usurped that role in many communities. Punishment and Inequality in America profiles how the growth in incarceration came about and the toll it is taking on the social and economic fabric of many American communities.